Paul Quinn was the Cardiff hero as he scored 8 points to help Cardiff clinch their third Gloucestershire League title in three years after a classic battle with Bournemouth in Bristol on Sunday last. Cardiff started well and found themselves 2 points up as Alan Burns kicked a fantastic point from long range which was followed by a well worked move culminating in Ciaran Slevin slotting between the posts. St Judes were duly shook into life by Cardiff’s quick start and created a chance of their own. Only a spectacular save from goalkeeper Aidan Farrelly kept Bournemouth at bay as the Cardiff defence scrambled to clear their lines. St Judes did get off the mark shortly afterwards after a great block by full back Martin Doyle forced them to take a point from a tight angle. Cardiff and Bournemouth traded points before Alan Burns popped up yet again to get his 4th goal in 2 games to put some daylight between the teams in the lead up to half time. Daire Foley and Cathal Garvey were drum tight in the corners as they dispossessed, tackled, blocked and boarder-line assaulted their respective men. Ollie Harney held the centre well as Dan McCool played a captains role and took a lot of punishment as he tried to force gaps in the Bournemouth backline from his wing back birth. On the other side of the half back line Johnny ‘solid 6’ Murray was typically creative when in possession and utterly destructive when not in possession. Both played their part as they created a scoring chance for centre forward David Tackleberry Quinn, one that he took with ease to send the teams in level 1-4 to 0-7 at half time. St Judes came out for the second half with intent as they ran at the Cardiff defence. This paid dividends as they scored 2-2 without reply. On paper this seemed to put the game beyond Cardiff, but back on grass, they simply refused to let themselves be beaten. As baseball great Tommy Lasorda once said, “there are three types of people, those that make it happen, those that watch it happen and those that wonder what happened.” 7 points down with 10 minutes left, St Colmcilles made it happen as the rest watched and began to wonder. As the fat lady cleared her throat, they didn’t so much stifle her as they did ram an O’Neills size five down her gob. Kevin Smyth and Ciaran Monaghan began to dominate in midfield flanked fantastically on either side by Dan McCool and Johnny Murray. If rumour is to be believed, if you cut Kevin Smyth open you’d find either a spare set of Mo Farah’s lungs or a Rolls Royce Engine, these reports are as of yet unconfirmed. Some intricate football resulted in a lovely lay off by Ciaran Slevin and Kevin Smyth kicking a lovely point to lift the Cardiff lads as they began to claw themselves back into the game. Barry McDonnell was robust at the back snuffing out attacks as Cardiff broke forward in droves and put enormous pressure on the Bournemouth defence. Paul Quinn took the game by the scruff of the neck and kicked 5 points one after another to put Cardiff back in the mix. This was followed up by another 2 points from Ciaran Slevin and David Quinn after good work by Alan Burns. At the other end a smart save from goalkeeper Aidan Farrelly and a great block by Daire Foley ensured that Bournemouth were rebuffed time and again. Martin Doyle conducting the back line before breaking forward and contributing a score of his own before Paul Quinn had the final word in what was a momentous comeback. 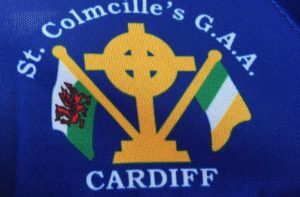 Possession, possession, possession was a call that resounded throughout the Cardiff team from start to finish and St Colmcilles were very efficient with ball in hand all afternoon. This yet again was testament to work being done behind the scenes to not only ensure that the Cardiff team had themselves physically ready but also mentally prepared. Bournemouth made life very difficult for long periods but it must be noted how strong the self belief was in the Cardiff camp. This is down to Marty Dolan and Mossy Burke’s great preparation work. Cardiff will now look to the Championship commencing later in August and hope to build on the success that they have had already this year. Lets add another bit of silverware to the trophy cabinet. Colmcilles Abu. 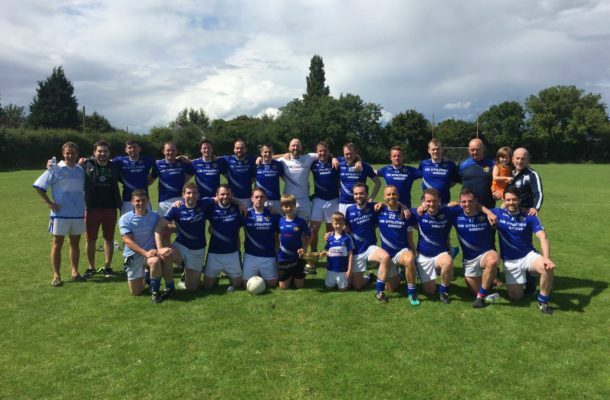 Cardiff: Aidan Farrelly, Daire Foley, Martin Doyle, Cathal Garvey, Johnny Murray, Ollie Harney, Dan McCool, Ciaran Monaghan, Kevin Smyth, Ciaran Slevin, David Quinn, Brian Gormley, Alan Burns, Barry McDonnell, Paul Quinn. Subs: Richie Murphy, Amin Dadger, Will Holten.